At present, China's annual consumption of beef is close to 8 million tons and the terminal consumption scale is abou 430 billion yuan. In domestic, beef consumption demand is increasing year by year, but cattle inventory is decreasing, so market gap between supply and demand is enlarged. Domestic terminal consumption market of beef will maintain stronger growth momentum. China’s beef consumption has been increasing at an annual rate of 3.9% since 2012, the total consumption rose to 7.76 million tons in 2016, and the market size of beef also increased to about 430 billion yuan in 2016 from 270 billion yuan in 2012. From the perspective of global consumption level, China's per capita beef consumption is not only far behind that of the United States, and also is 3-7kg lower than that of Asia, Japan and South Korea. China's imports and smuggling of beef account for about 30% of the total consumption, indicating that there is a huge gap of beef between supply and demand in China. 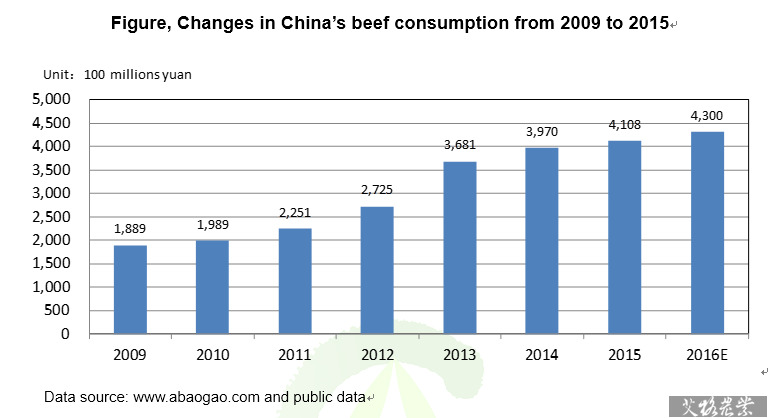 The import volume of beef is increasing in China in recent years, and has increased to more than 600,000 tons now from less than 10,000 tons in 2008. At the same time, China has become the most affected area of smuggling beef, and about 1.5-2 million beef is smuggled into China annually according to the estimation of experts from national beef cattle industry technical system. Currently, beef cattle raising in our country is small farmer dominated, and it’s difficult for backward production mode to meet market demand. The operating data of relevant beef cattle enterprises listed on stock exchange or the National Equities Exchange and Quotations is not ideal generally, and real brand leaders haven’t yet appeared, and beef cattle market has greater development potential. Why Doesn’t Feed Companies’ Investment Binge in Farming Cool Down?